Bluff stability has not been a major concern in the Sequim to Port Angeles area until recently. In the last few years we have seen large sections of people’s high bluff peel off and fall to the beach 100 to 200 feet below. The area that is most susceptible to bluff stability problems encompasses an area along the bluff to the west of the Sequim-Dungeness Lighthouse spit all the way to Port Angeles. In this article I’ll show you how to identify properties that are at risk, and if you’re looking at buying a home on a high bluff, this will help you with questions about bluff stability. I’ll show you how to do this online, and it’s easier than you might think. The image above was taken from a Google Satellite view. This is an area just west of Port Angeles on West Bluff Drive, and you can see a massive section of the bluff that recently fell away. The bluff is now approximately 80 feet from the road and about 76 feet from the corner of this home. This bluff is 175 feet high, so as I stood on the edge of the bluff and looked down, it was a devastating example of why bluff stability is a concern for anyone wanting to buy a home on a high bluff in areas where bluff stability is at risk. If you are considering a high bluff property, here’s how you can do an online analysis of bluff stability, and while this is not definitive by any means, it is helpful to recognize when there may be grave risk. When I talk about grave risk or any significant risk of problems with bluff stability, I’m looking at the obvious. Examples of obvious bluff stability risk would include a major section of bluff that has recently peeled off near a home, or a bluff that is less than 100 feet from a home, and if a bluff is only 50 feet, more or less, from a home, I would consider this grave risk. Remember the context here is high bluff property, which is higher than 50 feet by my definition. A low bluff presents much less risk. Another important factor that determines risk is vegetation along the bluff with deep root systems. All of this is viewable online now. You open your Google search engine, and type in the property address. Then click on “Maps” and you will get a nice Google map with your property at the center. Now choose the Google map option called “Satellite” view. This will show you exactly what the property and the bluff look like, and you can see how far the bluff is from the house and how much vegetation is on the bluff, if any. Less vegetation or no trees or shrubs means less bluff stability. You can also see how steep the bluff is. 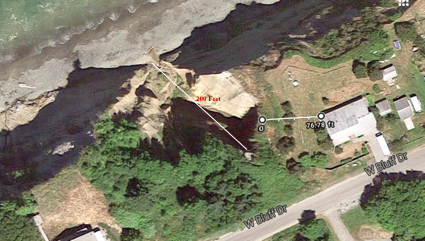 You can measure the distance from the house to the top of the bluff with this Google Satellite view. You right click to show the option “Measure Distance,” and then you place a marker at the house and one at the top of the bluff. Google will measure the distance in feet. This is an incredibly accurate measurement, although I will qualify that by saying that it is possible the bluff has peeled off more since the Google Satellite image was last taken. Although Google Satellite maps do not show you the date the image was taken, you can find out by using Google Earth, discussed below. Google maps and Google Earth use the same image, and when you are in Google Earth, the date is shown at the bottom of the image. The date of the image above is 7-15-2013. As long as I’m giving you powerful free tools to do a cursory bluff stability analysis, here’s another fantastic tool to tell you how high the bluff is at a particular location. You cannot use Google maps for this, but Google has another tool to measure elevation, and it requires that you download a free tool called Google Earth. Once you have that installed, you type in a property address, and then you use the “path” tool to mark the property in two spots at the bluff and down on the beach, and then you will find the option to measure elevation. If you need help with that, do a Google search on “how to measure elevation” and you’ll get specific instructions. There you go. Now you know how to do your own quick analysis to examine bluff stability. You can drag your Google Satellite view along the bluff from Port Angeles to Sequim and see how many homes are at risk. It is surprising how many homes are right on the bluff or within 25 to 75 feet. Read more about local Bluff Stability. Bluff stability on the Olympic Peninsula has become a greater concern in recent years.